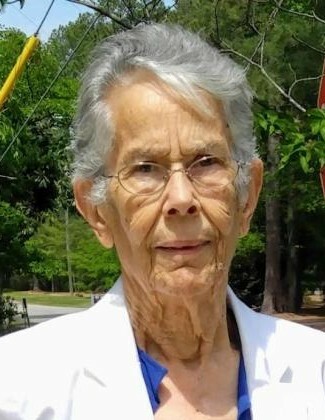 Ethel Mae Brewington, 92, of 109 Tomahawk Trail, passed away Friday, January 18, 2019 at her home. Funeral service will be held at 2 PM, Monday, January 21, 2019 at New Bethel Baptist Church with the Rev. Terry Cummings, Rev. Eddie Smith and Rev. Ken Simmons officiating. Interment will follow at Grandview Memorial Gardens. The family will receive friends from 6 PM – 8 PM, Sunday, January 20, 2019 at Crumpler-Honeycutt Funeral Home and at other times at the home. Ethel, born in 1926 in Sampson County, was the daughter of the late Henry Ashford Brewington and Mary Virginia Jones Brewington. In addition to her parents she was preceded in death by; her husband of fifty years, James Hardy Brewington, sons, Hardy Linwood Brewington and Alford Lee Brewington; brothers, Freddy, Cornelius, Hubert and Thomas Brewington; and sisters, Janie Ruth Brewington and Melrose Brewington Carter. Ethel worked in the textile industry, was an avid quilter, and was a member of New Bethel Baptist Church. Survivors include; daughters, Sue Faircloth (Chris) and Loria Whaley (Billy); ten grandchildren; twenty-one great grandchildren; sister, Mary Raines (Russell); and brother, Bertus Brewington (Rosie).